This small, black evening clutch is made of silk dupioni, with matching silk lining and inside pocket. 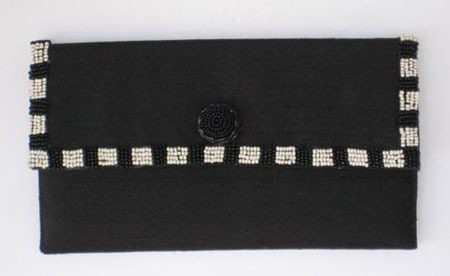 Black & white beaded trim around flap. Beaded button embellishment. Magnetic snap closure. Size is approximately 8-1/2"W x 5"L.